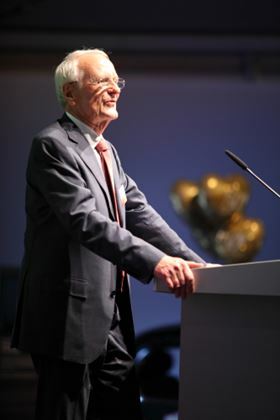 Celebrations have taken place in Germany to mark Busch’s 50 years of developing vacuum technology. The company started in 1963 when Dr.-Ing. Karl Busch and his wife, Ayhan Busch, had the idea of designing simpler, better and more user-friendly industrial vacuum technology into practice. In practice, this meant that they could give users exactly what they needed, and 50 years on the global success of Busch Vacuum Pumps and Systems is a testament to that philosophy. Since 1963, Busch has grown from a small company into an international group with more than 2,600 employees. The team spirit of a family company has remained constant, however, and the company’s vision has been celebrated where Busch began, in Maulburg, Germany. All the general managers from the 57 Busch companies located in 39 countries attended the celebrations, accompanied by their customers and business partners. The banquet hall was filled with 350 international guests for a festive anniversary evening celebrated with a ‘Black Forest’ theme. The company is proud of its roots in the valley of the River Wiese, in the southern part of the Black Forest. This is where Dr. Karl Busch's grandfather, Karl Wittig, laid the technical foundation for vacuum and overpressure technology more than 100 years ago by developing a rotary compressor. 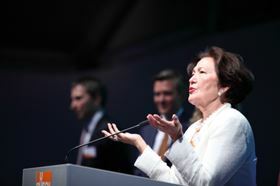 The evening began with a speech by Dr. Karl Busch and his wife, Ayhan Busch, discussing Busch's basic principles. Afterwards, Ayla, Sami and Kaya Busch provided insight into the history and development of Busch in their presentation. To mark the fiftieth anniversary of the company, the ‘Busch Award’ was presented for the first time. This distinction goes to companies that harness modern vacuum technology and apply this to innovative processes. The first prize winner was GEA Food Solutions GmbH, located in Düsseldorf. The company succeeded Union Verpackungsges. mbH, which was founded in 1957 in Kempten and it was the Union company that developed a new type of packaging for fresh foods in the early 1960s: vacuum packaging. The first suitable materials for such packaging had become available and now the goal was to develop a machine that could automatically shape plastic film into the form of a tray in which food could be placed for packaging. Using additional plastic film, an airtight seal would be created while the air within was simultaneously sucked out. This needs to happen as quickly and effectively as possible while at the same time, a high vacuum in the package would have to be ensured. Busch undertook the development of the technical solution for vacuum generation for the Union company and created suitable vacuum pumps with the Huckepack. Afterwards, the Union company was able to present the world's first automatic thermoforming packaging machine and vacuum packaging was born – the result of innovative ideas and effective cooperation. Dr Karl Busch was able to present the award to Manfred Schmidt, purchasing manager from GEA Solutions and Christoph Ullmann, who was the original designer of this first packaging machine. The speaker at the Busch anniversary was Professor Dr. Hermann Simon, who wrote the bestselling book, Hidden Champions – On the Way to Globalia, which was also the topic of his lecture. ‘Hidden Champion’ refers to medium sized companies that operate with extreme success worldwide, thus becoming the leaders in their respective markets. These companies distinguish themselves with tremendous innovative strengths and are considered to be job creators in their own country. In the process, such companies set extremely ambitious goals and strive for growth and global market leadership. This is achieved by focusing on niche markets and close cooperation with customers. Internal success factors include streamlined organisation as well as close relationships with employees and thus, low fluctuation rates. For Dr. Simon, the ‘Hidden Champions’ are the spearhead of the German economy in the global market. Before the evening programme, tours through Busch's modern manufacturing facility took place. Mechanical manufacturing and assembly of different vacuum pumps and vacuum systems were presented. At separate information points in the production plant, guests learned interesting facts about different topics such as training, quality management or vacuum technology applications. Concrete physical experiments with a vacuum were performed in a ‘Vacuum Lab’. During the following weekend, employees from the main site in Maulburg and all German subsidiaries as well as the Swiss Busch companies in Magden, Porrentruy and Chevenez were invited to a family day held in the plant grounds. Approximately 1,700 guests populated the company grounds, where many activities and attractions were set up for young and old alike. The Busch family received standing ovations and gifts, including being presented with a Busch logo made up of portrait photographs from all the employees. As a globally active company, Busch is celebrating at all its national plants around the world. The anniversary celebrations began in the spring at the Busch companies in Asia, and after Europe they will conclude in America this autumn.